Imbolg is also know as Candlemas, a name which derived from the practice of ritually lighting fires to lure back the slowly waxing Sun. Little wonder the Sabbat is called the Festival of Lights. Although this is a fire festival, candles are more often lit than balefires. This is probably because the gentle fire of a candle better represents the Sun at this time of year. A popular candle-lighting custom of Anglo-Celtic cultures was to have a young woman, representing the Virgin Goddess, enter the ritual area carrying a circle of lit candles. This was a lighted Sun Wheel, a symbol of the Wheel of the Year being warmed and lighted again by the returning Sun. Later, the candle wheel was worn as a chaplet on the head. Edain McCoy in _Sabbats: A New Approach to Living the Old Ways_ says this idea originated with Norse Yule customs. In Sweden today, this custom remains intact. There the crown is usually made of woven wortleberry twigs or evergreen boughs, and is used in the celebration of St. Lucia's Day (December 13). Lucia, by the way, is probably a later incarnation of Lucina, Roman Goddess of Light. Many covens and solitaries still practice this custom at Imbolg, and great care and creativity goes into ensuring the safety of the wearer. Non-drip candles are a must. OBLIGATORY DISCLAIMER: I should say here that I assume no responsibility for your actions should you choose to try any of these ideas. IF YOU CHOOSE TO WEAR THESE CANDLE WHEELS, BE EXTREMELY CAREFUL THAT YOU DO NOT SET YOURSELF OR YOUR SURROUNDINGS ON FIRE. HOT WAX CAN ALSO BE DANGEROUS. In their book, _A Witches' Bible_, the Farrars recommend wearing a skullcap of aluminum foil on the head to keep wax spatters off the head and scalp. They also recommend using white birthday cake candles. These don't generate much wax to speak of and will burn for the time it takes to complete a ritual. Instructions are easy: Measure a thin cardboard band to the head of the wearer. Lay a piece of scotch tape STICKY SIDE UP along the top edge of the band. 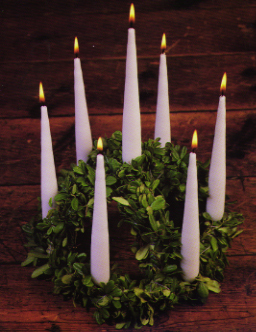 Position 8 candles, one for each Sabbat in the Wheel of the Year, evenly along the crown. Lay another piece of tape, STICKY SIDE DOWN over the candles. Secure the candles and tape strips to the crown with more tape. Now cover the crown with aluminum foil, enough to support the candles upright while on the head. Weave evergreen or plastic foliage around the crown. 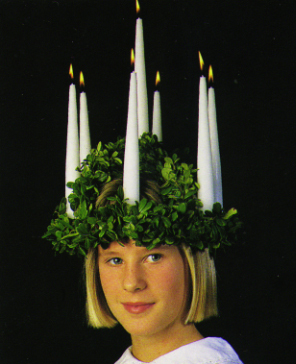 The Farrars also recommend making battery-powered crowns -- much like the battery-powered and electric candles we see in windows at Yule. Carrying a battery pack around on your head may be a challenge, but infinitely safer than lit candles! Experiment with this one. Plastic toy St. Lucia crowns can be purchased in Sweden. First decide how big you want your wheel to be. McCoy in _Sabbats_ recommends an outer circle of 11 inches and an inner circle of 9 inches. Use your ruler to evenly space the candles, then mark the spots with a pencil. With super glue, glue the candle holders to the cardboard at those spots. (Place something heavy on them as they dry overnight). The next day, wrap aluminum foil around the cardboard to round its form and lock the candleholders in place. Wrap your greenery around the foil. Fasten it in place with glue or florist's wire. After decorating is completed (red or white ribbons might be appropriate here), place the 8 candles in the candleholders and light.